Good-quality forage for beef cows is in short supply this winter and the price of grain is still relatively expensive across Western Canada. The good news is well-balanced rations still can be put together for late-gestation beef cows to prepare them for a good calving season. This is a good reminder I received recently, when a feed mill owner and I walked with a producer to assess the body condition scores (BCS) of his 250 late-gestating black Angus cows. With this valuable information, we could help this producer by formulating a new feeding program tailor-made for his cows until the start of the calving season in late February. 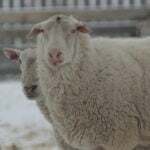 Before we did this cow herd assessment, we took stock of the producer’s on-the-farm feeds, which encompassed a couple of hundred fair-quality grass round bales, 100 to 200 corn stover bales, about 200 cereal straw bales and a small pile of beet pulp. 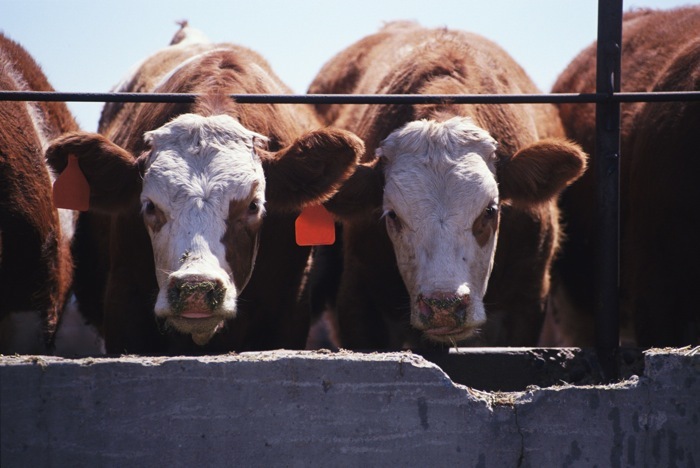 It was our understanding that no grains were available on the farm, but a 10-tonne grain bin contained 14 per cent cow-calf screening pellets. Up till now, this cow herd was fed an early-mid-gestation diet consisting of barley/oat straw supplemented with a few pounds of grain-screening pellets and complemented with a standard 2:1 commercial mineral and salt. The results of our BCS assessment showed most mature cows and replacement heifers had a BCS of 5-6 (re: scale of 1 = emaciated, < 4 = thin, 5-6 = prime, and 7 or greater > fat). To us, these individual scores represent the level of body fat covering, which is a snapshot of energy status that each cow draws upon during periods of dietary energy deficiencies to maintain vital and productive functions, especially in preparation for calving. 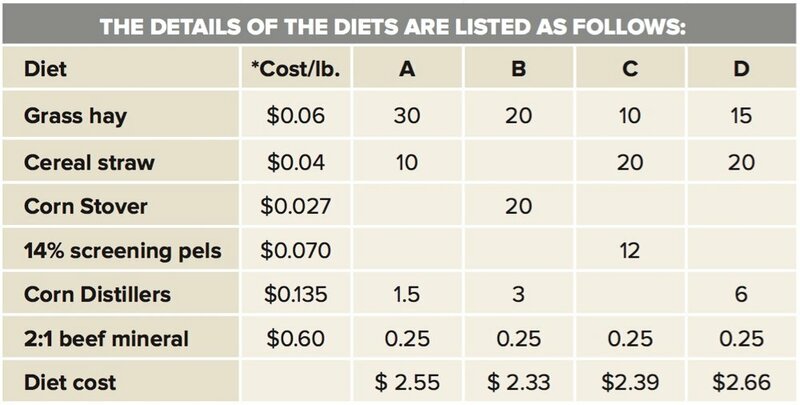 *Nutrient value and cost per ingredient are estimated and varies among farms and regions. 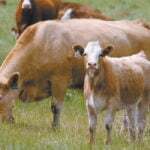 Cows in prime shape also have more vigorous calves, because 75 per cent of fetal growth occurs during late gestation, which is directly related to the respective nutritional status of the cow. 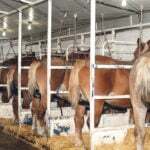 For example, “fetal programming” has been established by many university field trials, which shows replacement heifers’ lifetime growth and reproductive performance can be significantly affected by their mother’s nutritional status during all stages of gestation, including two to three months before calving. The feed mill operator and I offered four feeding programs specifically formulated for these well-conditioned late-gestation cows and replacement heifers. Dry matter intake estimates are about 35 to 40 lbs. ; mature cows, and 30 to 35 lbs. ; replacement heifers. 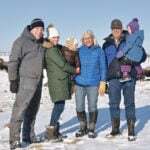 The energy density should be increased in these diets as the weather gets colder, which is based upon this rule of thumb: For every 1 C drop in temperature below 0 C, the beef cows’ TDN energy maintenance requirements are increased by about two per cent. This means that a few extra pounds of DDGS or grain screenings in each feeding program be provided. An important strategy: save and use more nutritious forages such as grass hay as compared to other low-quality forages to help meet the late-gestation cow’s nutrient demands. Then, transition it into well-balanced diets after calving.